Employees access sensitive data with tablets and other mobile devices. ESG research indicates that manyusers access company confidential data, customer data, and regulated data via an army of mobile devices. A lack of security controls will inevitably lead to some highly publicized disclosed data breaches or routine regulatory compliance violations. CISOs are leaning toward data security controls for tablets. Large corporations may install endpointsecurity software controls on tablets over time, but in the near-term, security executives have issued a clear directive around data security. DLP for tablets is the best initial fit. DLP tools have oversight over users, devices, and data. By tracking allthree parameters, these tools can execute granular security policy enforcement decisions, making them extremely flexible and effective. 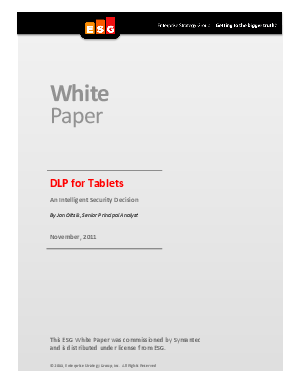 The best DLP for tablet suites will give users the freedom to access corporate and personal data and applications, align device-centric and enterprise policy management and enforcement, and provide central command-and-control and reporting.